I stumbled across a video from Guatemala with a MASSIVE sinkhole (below) which then lead me on a hunt to learn more. According to wikipedia, sinkholes may be formed gradually or suddenly, and are found worldwide. 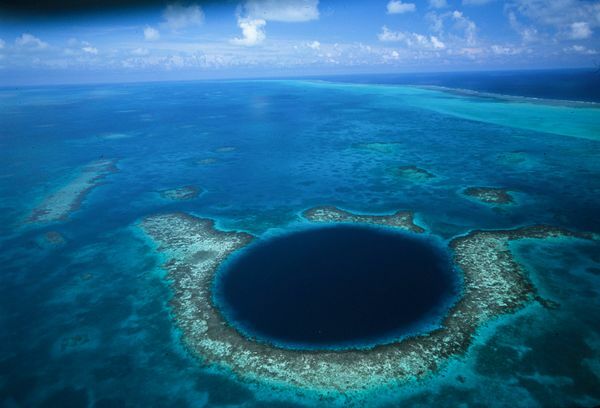 I found another video called “8 amazing holes” and it was on that video that I first saw the “Blue Hole” in Belize. I’m not sure how I missed ever hearing about this specific one, as a handful of my friends have visited Belize and my brother-in-law’s family is from there. As soon as I saw the gorgeous photos on Google images, I was immediately drawn by its beauty. ….Annnnnnd that’s where it stopped…its beauty. …nor would it ever cross my mind to jump into it! Who does that?? I have to say, even though I’m not the skydiving-type, I have to admit that the view is gorge! Regardless, mother nature never ceases to amaze me! What natural wonder amazes you? Belize is a country located on the north eastern coast of Central America. It is the only country in the area where English is the official language, although Kriol and Spanish are more commonly spoken. Belize is bordered to the north by Mexico, to the south and west by Guatemala and to the east by the Caribbean Sea.